[Nella Fontaine Binckley, "Odds and Ends from an Artist's Life," Chapter III, part 3. From a transcription annotated by Patricia D'Arcy Binckley of typewritten original, February 25, 2005. Original "written some time after 1941 by Nellie F. Binckley, 1860-1950 or 51." Notes in brackets are mine, unless followed by the initials "P.D.B." Occasionally, additional paragraph breaks inserted for easier reading. He [John Milton Binckley] had been an editor at various times. Before he was married, [September 15, 1859 -- P.D.B.] he had been the editor of the old National Intelligencer [italics added] in Washington, the forerunner I believe of the present Evening Star [italics added]. He told me his mother used, occasionally, to write an editorial. And I remember that he said his brother Phil [Philander Binckley] was the most intellectual man he had ever known. And he had known many. He knew Horace Greeley very well and Walt Whitman, whom he admired very much, and also the poet of the Sierras, Joaquin Miller. Dad wrote a very illegible hand, but boasted -- like Horace Greeley -- that the printers could always read it. Which reminds me of a story I read once of Greeley. In the early days, the [farmers] used to pay their subscriptions to the Tribune with farm produce which they brought to the office: butter, eggs, etc. One day a farmer brought in, with other things, a tiny chick. Some of the reporters there thought they'd play a joke on the compositor who always handled Greeley's manuscript and who bragged he could always read it. SO they inked the chick's feet, and put it on a sheet of paper and got a lot of marks. Then they gave it to the compositor, saying Mr. Greeley had just sent it in. The compositor set it up, and it read very well! Another celebrity Dad knew was of a different kind. That was King Kalakauea of Hawaii. The dusky king was a genial fellow who liked to make trips to Europe; the crowned heads all entertained him at their palaces, treating him as one of themselves, and he was immensely popular. Dad [liked] him. A friend of Father's, a tall fine looking man, used to come and see us. I remember Father telling us of his miraculous escape in the terrible Chicago fire, started by Mrs. O'Leary's cow, who immortalized herself by kicking over a lamp. I do not remember the details now. But somehow the gentleman was trapped in a big office building and went up on the roof. There was no way of escaping. Next door was a vacant lot where building operations had been started. There was a tremendous derrick standing there, not very far away. A rope attached to it hung down to the ground. The desperate man measured the distance with his eye. As it happened, he was a trained athlete. It was his only chance. He leaped across the gulf, caught the rope, and slid to the ground. Father and Mother were a very devoted couple and our family life was tranquil. Dad was a great smoker and Mother let him smoke all over the house. We were brought up in an atmosphere of tobacco smoke. Yet neither of my brothers ever smoked for some reason. One day when Grandmother was staying with us, we heard that a neighbor was sick. Grandmother went over at once and took charge till the lady was able to get up again. [Poor] grandmother was utterly flabbergasted when the lady asked for her bill. She had only followed the usual Southern custom among neighbors. On September 29th [1875 -- P.D.B.] my sister was born and the doctor thought Mother should not go through another Chicago winter so soon after, as she was very sensitive to cold. So it was decided that Mother, George, the baby [May] and I should go south to [Abingdon, Virginia], where Grandmother was at the time. I was delighted, as I, too hate cold. Father had rather Spartan ideas about sleeping in a cold room and bathing in cold water. It was supposed to harden you, I imagine. But somehow I never hardened. I had the most awful colds all winter. In the South it was all right, but below zero! I never could understand how anybody could go to the Arctic regions from choice. I heard of a missionary who was sent to Greenland. Somehow he did not make any converts. So the church thought they'd better send out a younger man. When the ship got it, the resident missionary took the young man aside. "Son," he said, "I want to give you some advice. Don't preach 'em a hot Hell. That was the rock I spit on. They all wanted to go there. Preach 'em a cold Hell." Certainly that's the sort of Hell that would keep me in the straight and narrow. My brother Harvey stayed with Father. 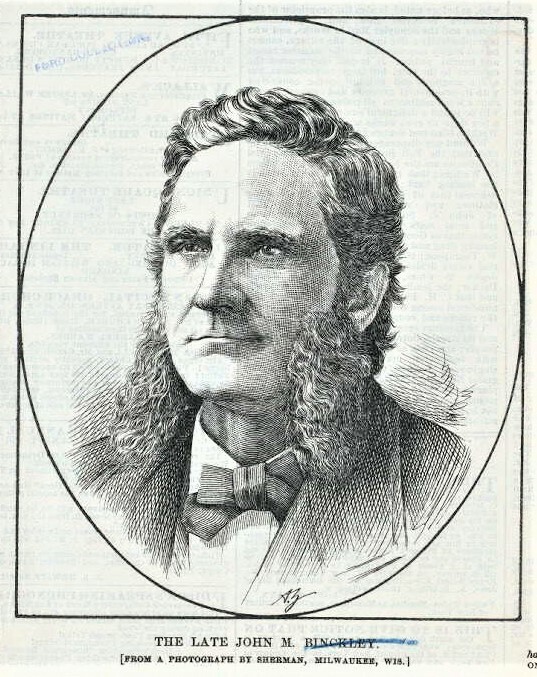 Philander H. Binckley (circa 1826-1898). Walt Whitman (1819-1892) worked for John Milton Binckley as a clerk in the Attorney General's Office in 1867 and 1868. Several letters document their connection. Here is a link to one of them.